I’d be interested to know whether anyone’s actually ever found one of these. I certainly haven’t, but perhaps I don’t have the patience to look for long enough. I have a pot full of those lil’ 4 leafed clovers… but no luck. Maybe I should stop my rabbits from eating them, huh? my grandmother has discovered at least 20 of those, it’s like her hobby. I did once or twice, when I was a kid and sat on grass/clover an awful lot. I used to pull the old “two two-keaf clovers” trick all the time. I indeed have found one! And have a friend who once found five in one go. They’re out there. Just ~hiding~. Daughter failed to find one after looking for fifteen minutes. She stopped looking and after a rest, got up and found one straight away. I think there’s a lesson to be learned there. I have found 3 when i went to elementry. Mainly cause i usually did my own thing at recess (i was a curious child). That and my friend and I needed some pep for our mario kart game (forgot to preserve the damn things so they shriveled up into dust in day. I found one quite recently, but I didn’t press it properly and it wilted and went brown and died. I was at a cure concert held in a park. My friends and I sat down to rest for a bit, and I looked over and saw a 4-leaf clover! I kept it in my wallet for a while and have since laminated it. It’s not vibrant green anymore (a bit brown), but I still keep it on me at all times. I heard a 4-leaf clover is actually a mutation or something. Not sure though. This! They are a type of mutation, though a natural one. That’s why you can find patches of them. If you’re having trouble finding some then look in different patches. I’ve found 3 so far this summer, 2 when I was looking, the other I had stopped and knelt down to unclog the lawnmower and there it was. I pressed them all in wax paper in my big Grimm’s Fairy Tales book. I’ve found several. They just seem to pop up whenever I start looking at large patches of clover. I’ve even found a five-leaf-clover once, but it hab been gnawed by snails or bugs or whatever, so it’s kind of a sorry sight, all tattered. But you can still see there’s five leaves. I was heading off to a competition for school, and my boyfriend handed me a book and told me to go to a certain page. In it was a four-leaf clover he found just for me. Wow, I really thought they were more or less impossible to find! Maybe next time I’m in the park I’ll have a better look because I’d enjoy the extra luck that a four leafed clover is guaranteed to bring. Poor Colin! I’ve found one or two before, my sister has found a lot though! 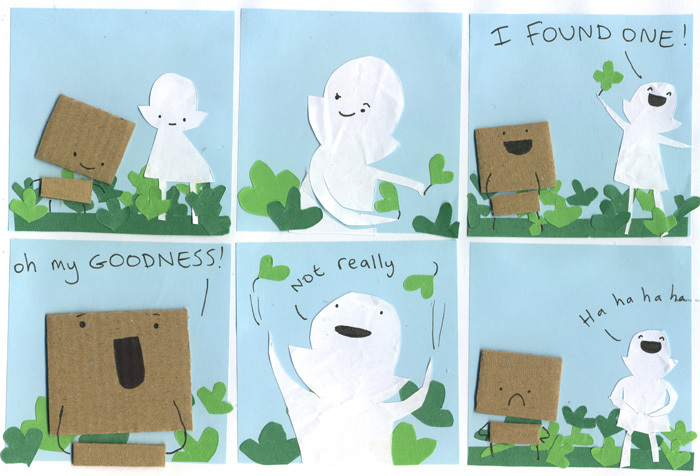 They’re really difficult to find! and then I broke my collar bone! My mother has found dozens upon dozens of four leaf clovers. I can’t open a book of ours without a bunch of pressed clovers falling out of it. I found one when I was a little kid, around 5 or 6. They are actually pretty common in some places. My friend’s grandfather actually tinkered around in the greenhouse long enough to come up with a strain of very large clovers that always grow four leaves. I think that might be cheating, though. I wonder if there are certain conditions that make the mutation more common. I know that you can buy necklaces with four-leafed clovers dipped in gold, or preserved in plastic. You’d think that a company that could manufacture enough of those to sell must have found a way to grow more four-leafers than usual. I have found quite a few 4 leaf clovers but it does take a lot of patience. When i was younger I went through a phase of looking for them and almost always found one if I really put my mind to it. They tend to come in groups. If you spend about 5 mins looking at one patch and dont find anything move away to a different area/patch. We have a little patch in our garden with almost more four leafed clovers than the regular three leaved ones. So we started looking for five leafed ones. There were also a lot of them. But I can’t recall where I put that one, it was about seven years ago. Maybe I should start looking at that patch more often again. i found a five-leaf clover years ago and i sealed it between two pieces of tape. it’s still hanging on my wall. I’ve never found a four leaf clover, but my parent’s friend has found a couple of FIVE leaf clovers and one SIX leaf clover, and one very rare SEVEN leaf clover. I find them quite often once I found 8 in one day. and… I love Colin, Pauline, and especially Polar Bear <3 your characters are awesome. …ummmm…. clovers have three leaves, not two. was my first reaction. once my brother found a SIX LEAF clover. My friend found two! However, she keeps being mean to me and saying we were never friends when we made friends the day before she said we never were! I’m really confused! What should I do?! I found like 5 in one day one time while waiting for the school bus… 1 day equals 20 minutes. I think it was a subpopulation where the mutation was common. I don’t think it’s that difficult. You’ve just got to find a patch with the mutation. If you can’t see one by quickly looking at a patch then move on to another. I have, they’re rare, but they plague their surroundings just like regular ones, so when you find one, the whole bunch of them are four-leaved. So if the first you see is three-leaved, just go search the next patch, there’s no four-leaved around. Or better yet, go further away search somewhere else entirely. It was around a tree nearby, but the tree died and people cemented the whole thing. I’ve found several over the course of my life. Two or three one summer when I was a kid, all of which my brothers eventually destroyed through various means. Once, a couple kids I was babysitting found like ten at a time in my front lawn even though I couldn’t even find one. And a while ago, I was on a phone interview for a job I really wanted, so I went outside and sat in the grass where it was quiet, and over the course of the phone call I found without looking both a four-leaf clover and a _five_ leaf clover. But… I didn’t get the job. I found this one little patch once where I not only found about twenty four-leaf clovers, but also a few five-leaf, six-leaf, and even a seven-leaf clover. They’re all glued in the back of my journal. When I was really young I used to find up to 8 leafed clovers, no joke! 4 leafed ones were really common in our backyard. I think the weed-killer might have just mutated them though.